A monstrous monitor that will serve fans of ultrawides, with so much screen space and decent gaming pedigree. Will definitely appeal to fans of ultrawides, given its picture quality, gaming pedigree and multi-tasking ability. The super-high price and inconsistent feature set remains a concern. Ultrawide monitors have their place among the best gaming monitors pantheon in PC gaming. 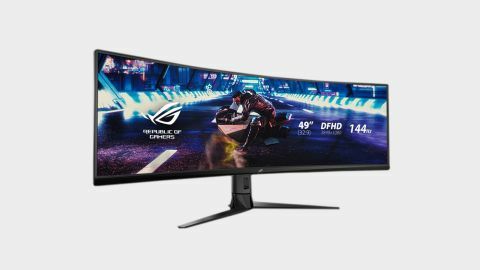 This new offering from Asus is a beast, claiming to include loads of gaming monitor benefits that are seamlessly integrated into its 49-inch, 32:9 display. The ROG Strix XG49VQ pitches itself as the antidote for having two individual 27-inch monitors for your setup, but in one convenient HDR-enabled display, geared towards gaming. It is a gargantuan bit of a kit, with a price tag to match ($1299 / £999), and will be aimed toward gamers who value screen space above all else but demand gaming pedigree alongside it. But does it justify the hype, the cash from your wallet, and the massive desk space it occupies? It’s a huge monitor that requires an enormous amount of desk space; it looks ridiculous and elegant in equal parts. With stand on, its physical dimensions stretch to nearly 4ft / 120cm in width, nearly 2ft / 60cm tall, and about 1ft / 30cms front to back. As a result its a heavy weight too, clocking in at 29.32lbs / 13.3kgs, and the weight gives it a solid and quality feel. It’s relatively easy to put together, too, though almost certainly demands two people to construct, just to avoid any potential accidents. It also comes in a fort-building worthy box. Admiring the monitor as a whole, it does have an undeniable cool-looking and chic aesthetic: from the twisted metal column and splayed out feet of the stand, to the super slim bezels bordering three sides (and the larger one at the bottom housing the controls), and to the pleasing radius of the curved screen, it’s a strangely beautiful, almost architectural thing. The XG49VQ has a series of features housed within that extraordinary design. The panel itself is a 49-inch, 3840x1080 resolution curved screen that works at a 32:9 aspect ratio. To manage and enhance picture quality it has DisplayHDR 400 (that can be manipulated through different presets to find the right settings for different medias and games) and Shadow Boost for enhancing details in darker areas but without overexposing images. Then, in terms of the speediness gaming monitors require, the XG49VQ offers FreeSync 2, a 144Hz refresh rate, and a response time of 4ms. For your gaming rigs (and possibly consoles), there is one DisplayPort and two HDMIs, and elsewhere there is a 3.5mm audio jack and three USB ports for your other bits and pieces. It also has speakers, but no-one really buys gaming monitors for the speakers. Setting it up and sitting down to work with the monitor certainly takes some getting used to and it immediately encompasses almost all of your field of vision. Enjoying the initial bath of screen space is a great experience: it’s immediately a crisp, bright and vivid quality of image. For reference, I first tested the XG49VQ on a PC with a pretty average spec: an RTX 2060 GPU, i5-9600K and 16GB of RAM. Turning to games, I had to test the office's current favorite Battle Royale, Apex Legends. Initially Apex wanted to be stretched across the whole display, so I indulged it, just for fun. Immediately, and obviously, this led to a huge downturn in performance. Naturally I turned settings down and addressed the screen ratio, but this in turn led to a series of events where, just to get Apex running semi-smoothly, I had to strip it back to limited graphical settings. While this is in part down to the realisation that our PC might not have been up to the task, it simultaneously indicates the power of the PC you’ll need to get the best out of this monitor. Our not-sluggish PC indicates that some much more powerful, and therefore expensive, components are almost certainly necessary to get the very best out of the XG40VQ (see below). Anyway, with some more tinkering, I turned to Metro Exodus which looked pretty good with the HDR and Shadow Boost active. However, again, I had to compromise on overall picture quality to get the smoothness of gaming down to a tolerable level. The same also occurred with Skyrim, too. Tacking onto this, at least with that PC, whenever I wanted to enjoy the mass of screen space by adding other tasks as well as a game, there was a performance hit with every additional task diminishing the overall experience. However, when we were able to hook it up to a bigger, better PC—an i9-9900K, RTX 2080, 16GB of RAM build—it was a different story. The extra power and capability of higher-end components came to the fore: Apex’s display stretched across the whole screen beautifully and proportionally and ran smooth and sharp; Metro Exodus filled the whole screen too (apart from the cutscenes which are obviously not meant for a 32:9 ratio). The image quality was excellent overall, though due to the screen’s size, it’ll ‘capture’ more light so you’ll need to manage the environment to reduce glare a bit. Playing both of these on the XG49VQ was an incredibly immersive experience, and it did feel like you had a better grip on what was going on, your peripheral vision expanded and enhanced. The gaming pedigree of this ultrawide did prevail—I just had to hook up a $2500 / £2100 rig to get the best out of it. Having the two PCs to test it on was very useful to shine light on the fact that you’ll really need those higher end specs and components to get the most out of this monster. When everything is running smoothly too, and you want to multitask or ‘multi-enjoy’, the screen size really comes into force, so you can easily window your game, and then fill the remaining space with work, media players, and the Great British Bake Off—like I did. Or play Skyrim on one half of the display and Apex on the other (both pumped to ultra settings)—like I did. This multi window use is what the screen was designed to offer you and it excelled, provided you have the means to put together a beastly PC. Lastly, to test out the Picture by Picture feature, and the monitor’s ability to house multiple devices at once, I hooked up a PS4 Pro just to see how it would affect or change the monitor’s behaviour and performance. Indeed you can use them together, however, beware: you’ll have to set your monitor refresh rate to below 60Hz for the function to even work and then you will lose all the gaming monitor capabilities (FreeSync, refresh rate and HDR), and be dishearteningly told about this through a series of on-screen messages. More screen or screens is a credible, and achievable, desire nowadays, and the inevitable toss up is between one screen that’s massive or multiples. While it tries, I’m not convinced the XG49VQ provides the solution. It’ll undoubtedly simplify a setup for those that desire a single screen to replace a multi-panel setup, but then it will have to do much more work itself—and so will your accompanying machine. The XG49VQ does offer great flexibility with its Picture by Picture mode, and an enormous amount of screen space, and combined with crisp image quality and decent refresh rates (when you’ve got the balance between in-game settings and your graphics card’s power correct), there is potential for this to be utilised effectively as a fine gaming monitor. But there are also undeniable stumbling blocks to the monitor being appropriate for everyone: the prerequisite of owning a powerful gaming rig, an enormous price tag, a lack of designated G-Sync compatibility, a decent but not exceptional level of HDR, and only a standard 4ms response time. I find it more useful to make a direct comparison between one ultrawide monitor, and two separate, smaller monitors that could provide all the functions and needs for high-end gaming, but also allow some specialization. For example, you could get a 30-ish inch QHD, HDR (and possibly 4K) monitor to give you excellence in image quality, and a superfast, pacey monitor to provide you with competitive gaming display speeds for the price of the XG49VQ. Or less. As an ultrawide this is a fine bit of a kit, providing you’ve got the PC to get the most out of it. However, those merely intrigued by ultrawides should know that while this has high-end quality in its design and build, and decent performance, it certainly isn’t for everyone. And it’s an expensive gamble if you’re merely curious.